Rich Ciotola farms with ox power in Massachusetts. Check out This New York Times Article to learn more. The signs of a good ox are are, thick, soft, smooth, short hair; short thick head; glossy smooth horns; large shaggy ears; wide forehead; full black eyes; wide nostrils; black lips; thick, fleshy neck; large shoulders; broad reins; large belly; thick rump and thighs; strait back; long tail, well covered with hair; and short, broad hoofs. The best colors are brown, dark red, and brindled. 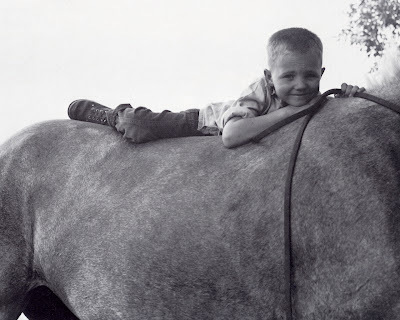 Young steers, intended for labor, should be early yoked, and taught to draw; for if this be delayed till they have attained considerable growth, they are more difficult to break. They should be moderately worked at first with old oxen, till they have acquired sufficient strength, and become inured to work. When worked much in wet weather, let the part of the yoke that presses against the breast and neck, be well rubbed with tallow, to prevent causing soreness. When an ox is eight years old, he should be turned off to fatten; and to promote his fatting, let a little blood be taken from him. If kept longer, his flesh will not be so good. The stronger ox should be unyoked first, as he is apt to be unruly, while unyoking his mate. Before horse power became popular in the Agrarian Nation, farmers used oxen. Even early into the 1900s many New England farms still utilized ox power. 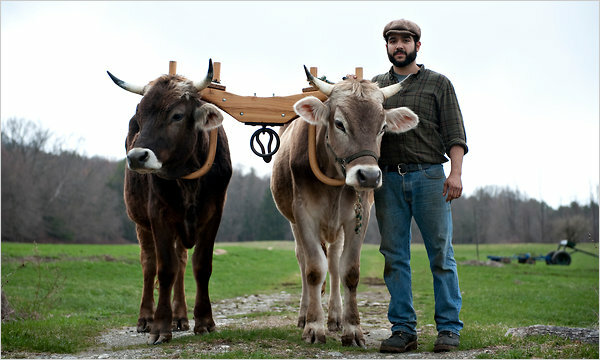 In the post-cheap-oil future that lies before us, oxen will once again be an important part of agriculture. Long ago and far away (Northern Vermont, 1977) I was a student at The Sterling School (now called Sterling College). The school had two oxen, Bonnie & Red. I had some opportunity to work with them and it was a wonderful experience. I've been particularly fond of oxen ever since. 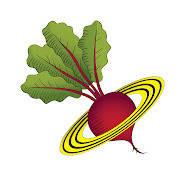 If you appreciate Agrarian Nation, please consider supporting this web site with a modest donation of $4.95 a year. The best inheritance that parents can leave their children is the ability to help and take care of themselves. This is better than a hundred thousand dollars apiece. In any trouble or difficulty, they will have two excellent servants ready, in the shape of their two hands. Those who can do nothing, and have to be waited on, are helpless, and easily disheartened at the misfortunes of life. Those who are active and handy, meet troubles with a cheerful face, and soon surmount them. Let young people, therefore, learn to do as many different useful things as possible. 1. 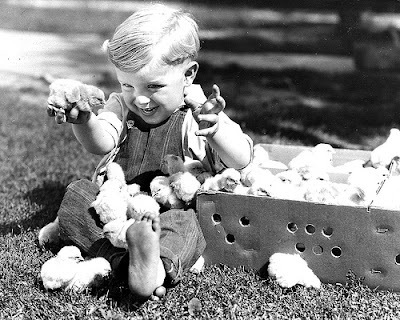 To dress himself, black his own shoes, cut his brother’s hair, wind a watch, sew on a button, make a bed, and keep all his clothes in perfect order, and neatly in place. 2. To harness a horse, grease a wagon, and drive a team. 3. To carve, and wait on table. 4. To milk the cows, shear the sheep, and dress a veal or mutton. 5. To reckon money and keep accounts accurately, and according to good book-keeping rules. 6. To write a neat, appropriate, briefly expressed business letter, in a good hand, and fold and superscribe it properly; and write contracts. 7. 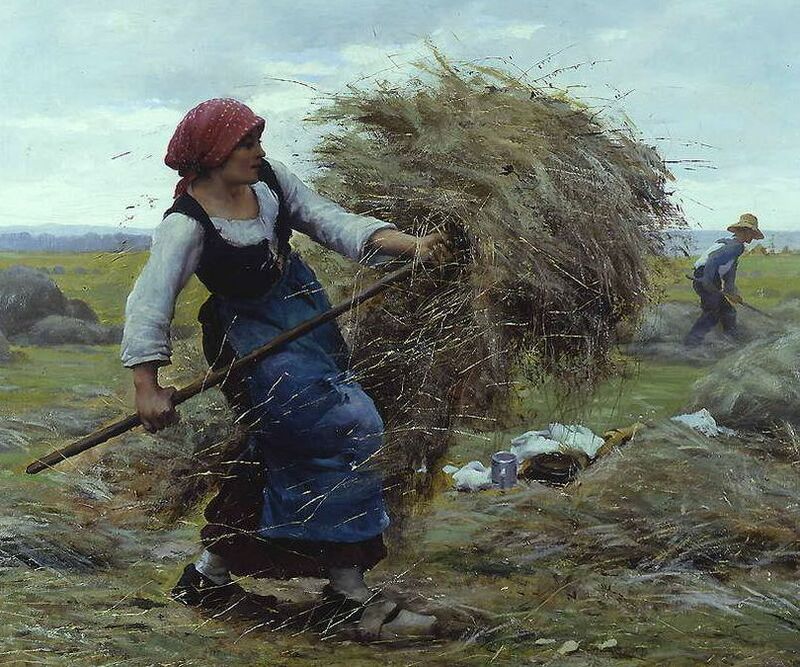 To plough, sow grain and grass seed, drive a mowing machine, swing a scythe, build a neat stack, and pitch hay. 8. To put up a package, build a fire, whitewash a wall, mend broken tools, and regulate a clock. There are many other things which would render boys more useful to themselves and to others—these are merely a specimen. 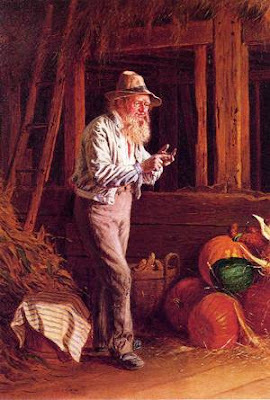 But the young man who can do all these things well, and who is ready at all times to assist others, and be useful to his mother and sisters, will command far more respect and esteem, than if he knew merely how to drive fast horses, smoke cigars, play cards, and talk nonsense to foolish young ladies at parties. Buckwheat is a grain that will grow on most poor soils. It delights most in dry locations, a soil inclined to gravel or sand. 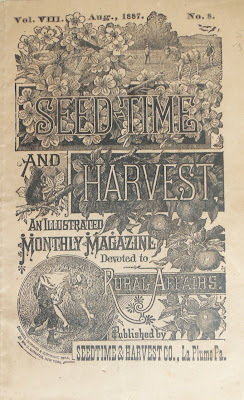 It has many qualities that recommend it highly as an article to be grown for the purpose of filling the soil with vegetable matter, of which it has been much exhausted in the states which we have known. In the first place, it will grow and produce a handsome layer for the plough on lands that will produce nothing else. In the second place, we do not find it an exhausting crop. 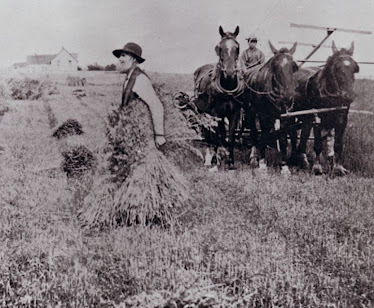 We can raise it many years in succession on our poorest lands without any manure, and we very commonly save fifteen or twenty bushels of the grain from an acre. This plant has a very small fibrous root and is easily pulled up by the hand. It has also a large branching top that never could get its support from this root. It has probably greater facilities for procuring nourishment from the atmosphere than most plants have. All theory and all experience unite in showing that this plant takes less from the soil than any other of the same size. In the next place, it has a rapid growth; six weeks in Massachusetts, being long enough to bring it in full blossom, when it should be ploughed in. Two crops may therefore be turned under in one season, and then it will be early enough (Sept. 1st) to sow down winter grain and grass seed. Another advantage attends the raising of this for grain or for green crops—the expense is not great. It usually bears the same price of oats, and is worth quite as much for fattening animals, and one bushel of seed is enough for an acre. When it is raised for the purpose of saving the grain, we often sow but half a bushel. The straw is also greedily eaten by young cattle and horses. Yet we have known large piles of the straw to be burned in the field where it was thrashed. The policy of raising so many acres of Indian corn on poor and reduced land, must be abandoned. 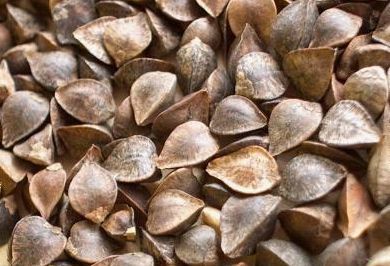 When more buckwheat can be raised on the acre than is obtained of Indian corn, it should be substituted for corn in a great measure, for it requires not a sixth part of the expense to produce it. Have you ever smelled a field of buckwheat in full blossom? It has an earthy-sweet, distinctive smell that some people do not like, but I love it. 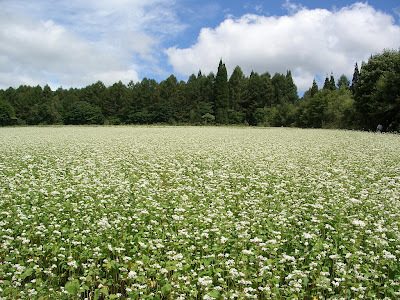 In fact, I stopped by a field of buckwheat the other day just to savor the aroma and the sight of it for a few moments. 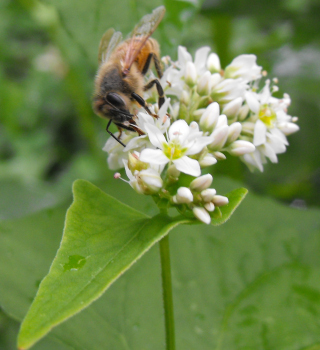 Bees have a particular fondness for buckwheat. The honey they make from buckwheat flowers looks blackish but if you hold a jar of it up to the light, you will see that it is actually a rich mahogany color, and full of healthy goodness. A lot of people sow buckwheat in their garden as a "green manure" and till the plants under (before they go to seed) as a type of organic fertilizer. I've done this many times over the years. And, as today's almanac excerpt explains, the old-timers did the same on whole fields. This was, of course, before synthetic chemical fertilizers came along—all farmers were "organic" farmers in the Agrarian Nation of 1842. 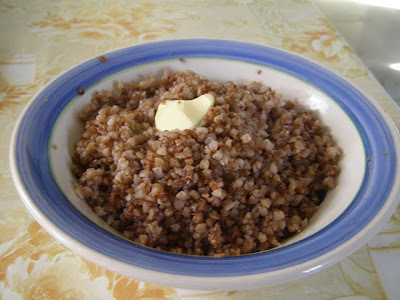 By the way, buckwheat is not a wheat or cereal grain. Technically speaking, it's more of a fruit. 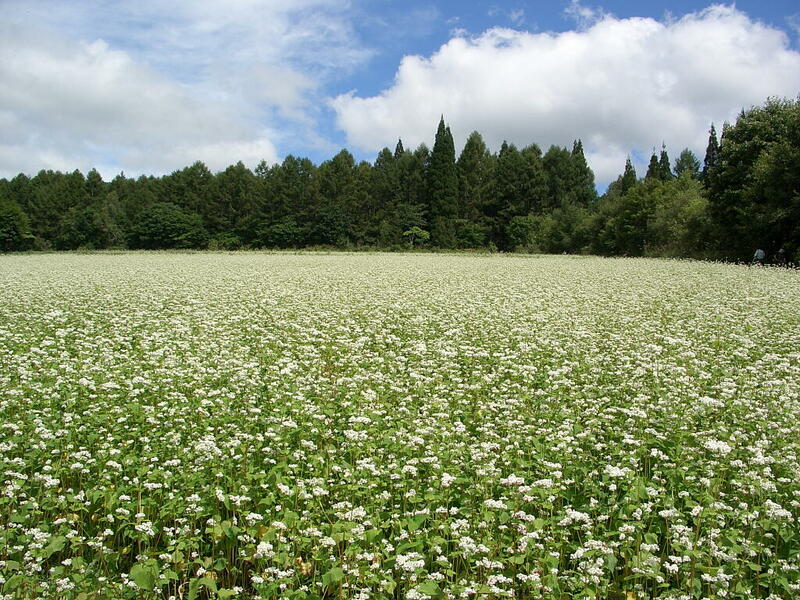 A field of buckwheat in blossom. Though you can't see any bees in the picture, if you were standing beside that field on a sunny day, you would see it humming with busy bees. with a modest donation of $4.95 a year. 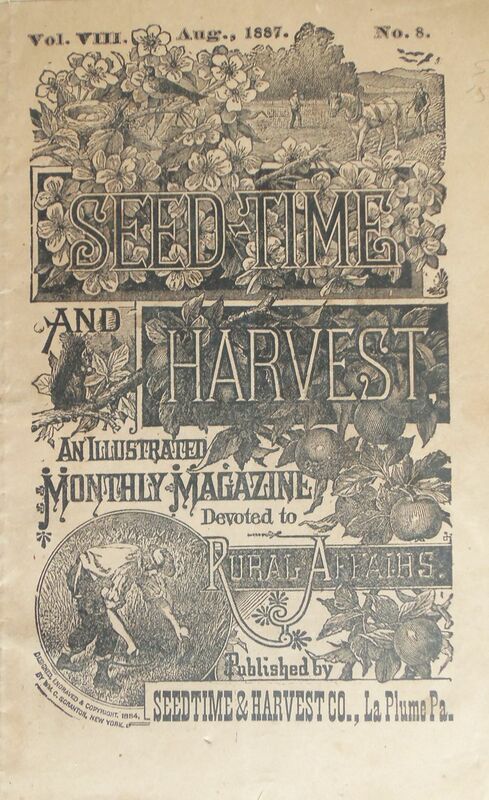 Today's excerpt comes not from an old almanac but from the 1887 Seed-Time and Harvest magazine (pictured below). The publication describes itself as: For Every One Who Plants A Seed or Tills A Plant. I like that. Under this head we propose to give choice selections in verse which we think worthy of preservation, either for their elocutionary or true poetic merits, or oddity. Contributions are solicited. We will print or return all we receive, so choice pieces may be sent without fear of loss. It is not clear if the magazine editor considered today's excerpt to be a poem of true merit, or an oddity. As far as I'm concerned, it's both. Hen stepped on one—then there were nine. One caught cold—then there were eight. One in the water trough—then there were seven. Mink took one—then there were six. Bee stung one—then there were five. Horse hit one—then there were four. Cat wanted one—then there were three. Roup took one—and left only two. 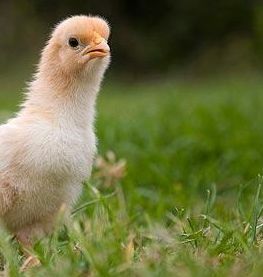 Two little chickens—see how they run! Here comes a hawk—now there's one. Coyote came by—and now there's none. This macabre little ditty reflects the sad reality of raising chickens on a small farm or homestead. No author is cited. 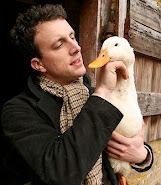 Does anyone dare to turn this poem into a children's picture book? The merchant or manufacturer may be robbed of the reward of his labor, by changes in the foreign or domestic market, entirely beyond his control, and may wind up a year, in which he has done everything which intelligence and industry could do to ensure success, not only without profit, but with an actual diminution of capital. The strong arm of mechanic industry may be enfeebled or paralyzed by the prostration of those manufacturing or commercial interests to whose existence it so essentially contributes, and on whom, in turn, it so essentially depends. 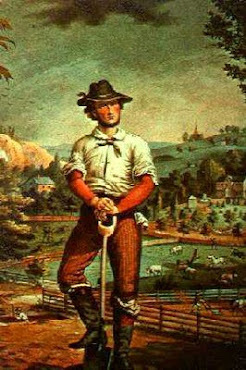 But what has the industrious farmer to fear? His capital is invested in the solid ground; he draws on a fund which, from time immemorial, has never failed to honor all just demands. His profits may be diminished, indeed, but never wholly suspended; his success depends on no mere earthly guarantee, but on the assurance of that great and beneficent Being, who has declared that while the earth endureth, seed-time and harvest shall not cease. Things have changed since 1855. Farming became industrialized and the industrial farmer of today falls into the category of "manufacturer" mentioned in the first paragraph above. 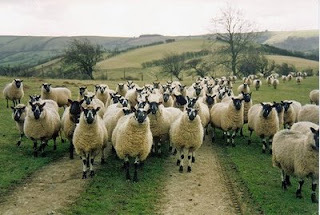 But there are a few farmers around who are managing to farm without buying into the industrial scheme. 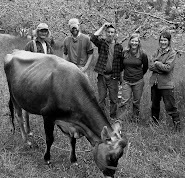 Such farmers have relatively small-scale, diversified farms and focus on selling direct to consumers in their community. As a result, they are not so interconnected with and influenced by larger markets and economic forces beyond their control. As the industrial age draws to a close, industrial farming will not be able to continue. It is clearly not a sustainable agricultural model for the long term. Thus, we will see a return to much smaller farms that serve, and are dependent on, their surrounding community and region. That is the way farming used to be in the Agrarian Nation, and the way it will be when we return to the agrarian paradigm.